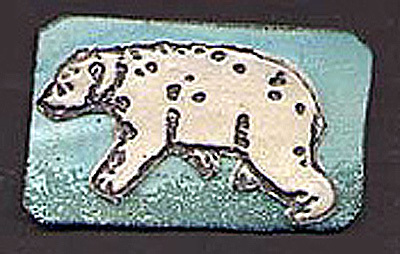 Just the Polar Bear in “Polar Bear and Cubs” is stamped on pearl polymer clay, trimmed and attached to a rectangle of pearl polymer clay that has been blended with blue pearl ex for a background. Clear beads have been added to the bottom of the background piece. The bear is attached, the clay baked and a magnet glued on the back. Clay magnet by Wendy Kerr.